Rhodes, located north east of Crete and south east of Athens, has some of the most interesting historical buildings in Europe. They are still very much a part of its landscape, within a very small area that was once the centre of a maritime and commercial empire, which was famous for its schools of philosophy, science and literature. All this is still evident when you walk within in the city’s walls and walk along its narrow cobbled streets and visit its imposing buildings. 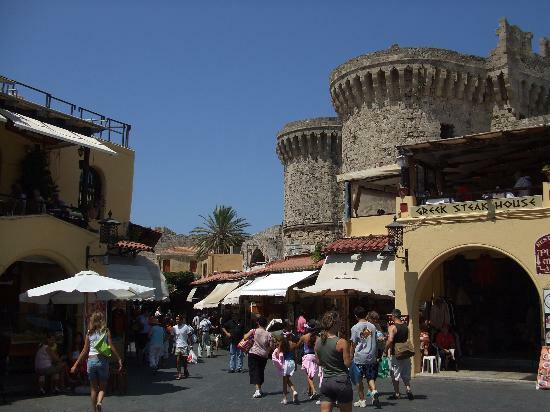 Rhodes was, of course, the home to the statue of Colossus and its old town is a World Heritage Site and all of this makes it a fantastic place to visit and explore. Even better if you can stay within walking distance of its historical centre, which is easily accessible on foot and won’t require a laborious coach ride or pot luck taxi driver. The harbour, which incidentally, was recently excavated and found to be the resting place of some very unique medieval shipwrecks and the little windmills dotted about all go towards making Rhodes an interesting and individual gem on the Mediterranean, it mixes culture and holiday fun beautifully. Rhodes has managed to reinvent itself as a thriving tourist destination without losing its unique historical identity. You can wander into the town centre and enjoy a beer at one of the charming outdoor tavernas and find yourself sitting within a lush green courtyard, tucked away out of sight of the main shops. There are plenty of restaurants to suit all budgets and there is never any pressure to leave your table before you’ve had a chance to enjoy a spot of people watching, especially in the main square where competition for your business is keen but not aggressive. A trip to Rhodes would not be complete without visiting one of the most interesting and imposing sites in Rhodes. It is the 14th century Palace of the Grand Master built by the Knights of Rhodes. After a short, slightly uphill walk, the palace stands before you and you can’t help but feel impressed by its sturdy, fortress like appearance. The huge airy rooms inside give you some idea of the importance of the inhabitants and there’s plenty to look at as you make your way around before arriving in its charming little outdoor gardens. This building appears in great contrast to the tiny homes that line the Street of Knights in Rhodes’s centre in which you can visit and look inside. The excavations allow you to see right into the fabric of the buildings before emerging, once again, into the bright sunshine and meandering streets of ancient Rhodes. We strongly recommend when travelling to Rhodes that you take out suitable travel insurance. If you head to www.cheaptravelinsurance.com, we found they offer holiday insurance cover to residents of over 140 countries.